Samsung Electronics announced today the availability of Portrait Displays’ new autocalibration software, CalMAN with AutoCal, on its 2017 QLED TVs. This software is used by professional video calibrators within the display industry, and most end users in the broadcast, production and post-production industries. Calibration is the process of gradually adjusting the color of a TV display. This process is especially important to designers, photographers and video professionals, who aim to match colors perfectly between input devices, such as monitors, and output devices, such as printers. Calibration provides users the ability to optimize their desired viewing experience based on their viewing environments. In partnership with Portrait Displays, the world’s leading provider of video display calibration software, Samsung QLED TVs are the world’s first TVs that support autocalibration for high dynamic range (HDR) picture quality. Previously, autocalibration was only available for standard dynamic range (SDR) picture quality. Traditionally, the calibration process could take hours as the users had to manually tune TVs via a remote control using an on-screen menu. This process was both a tedious and sometimes inaccurate method of calibration. 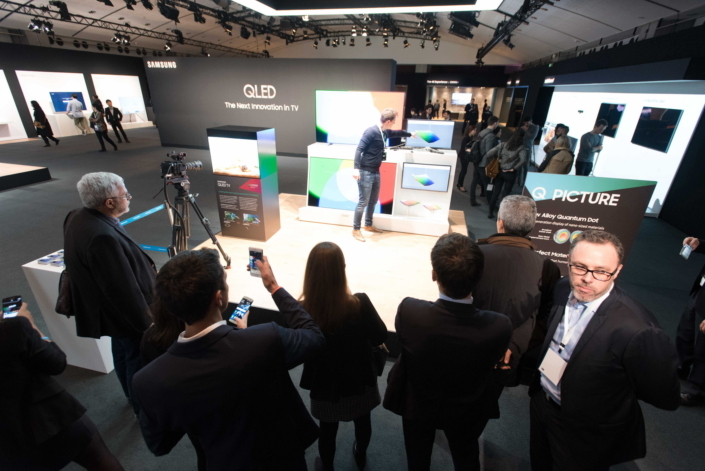 Today, QLED TVs with the CalMAN with AutoCal software automatically measure and adjust hundreds of settings in mere minutes with just a few simple clicks. To use CalMAN with AutoCal software on a QLED TV, users simply need to obtain the AutoCal Calibration Kit and install the software onto their computer. Once downloaded, users can connect their computer to their QLED TV to begin the autocalibration process. The QLED TV will then share its menu settings with the software so that it can automatically adjust the TV’s picture quality to the user’s preferences. Samsung QLED TV users can also measure the color volume of their TV using the CalMAN with AutoCal software. Color volume is the latest standard of picture quality that indicates how displays express color accurately, regardless of its brightness level. Samsung QLED TVs are the world’s first and only lineup that can express 100 percent color volume. 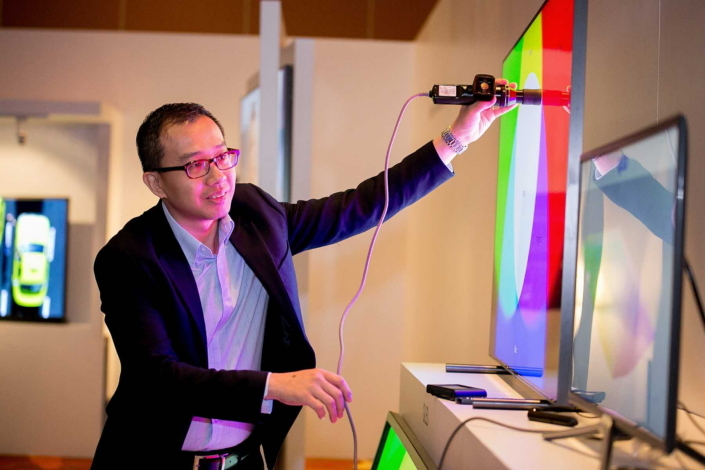 Attendees watch the demonstration about ‘color volume’, a new measurement of a TV’s picture quality, at the recent 2017 Samsung QLED TV technology forum in Singapore. For more details on Samsung QLED TV lineup, please visit http://www.samsung.com. Portrait Displays, Inc., since 1993, is a leading application software provider (ASP) for PC, smartphone, and tablet displays. The Portrait Displays team now includes SpectraCal, the world’s leading provider of video display calibration software. The combined companies offer value-added, feature-rich solutions to both OEM display manufacturers and end users seeking improved accuracy and manageability of their displays. Portrait Displays, an Intel Capital Portfolio company, is a private corporation with headquarters in Pleasanton, California, USA with representatives in Europe, Taiwan, China, Japan, and Korea.